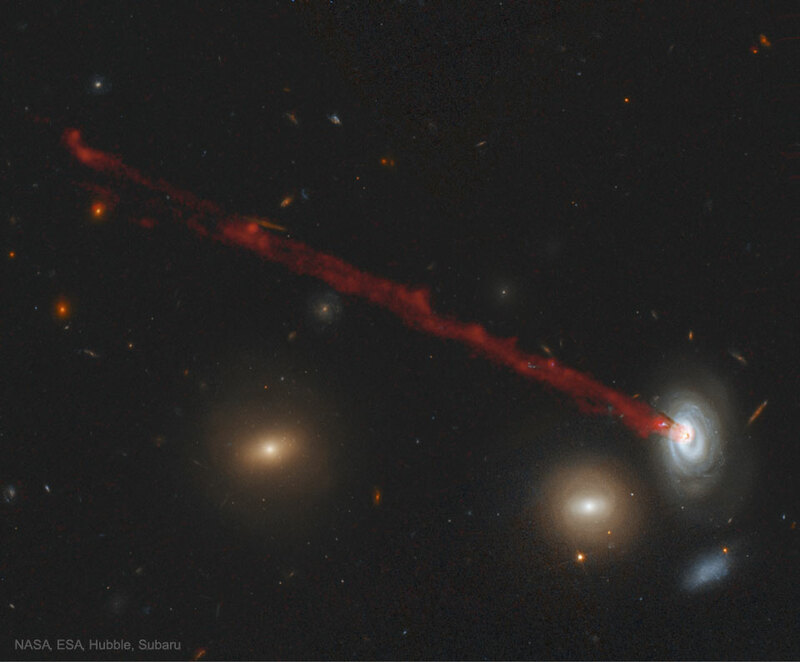 Explanation: Why is there long red streak attached to this galaxy? The streak is made mostly of glowing hydrogen that has been systematically stripped away as the galaxy moved through the ambient hot gas in a cluster of galaxies. Specifically, the galaxy is spiral galaxy D100, and cluster is the Coma Cluster of galaxies. The red path connects to the center of D100 because the outer gas, gravitationally held less strongly, has already been stripped away by ram pressure. The extended gas tail is about 200,000 light-years long, contains about 400,000 times the mass of our Sun, and stars are forming within it. Galaxy D99, visible to D100's lower left, appears red because it glows primarily from the light of old red stars -- young blue stars can no longer form because D99 has been stripped of its star-forming gas. The featured false-color picture is a digitally enhanced composite of images from Earth-orbiting Hubble and the ground-based Subaru telescope. Studying remarkable systems like this bolsters our understanding of how galaxies evolve in clusters.